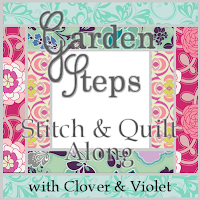 Week one of Rachel's from stitched in color handstitch class has come and gone. I loved it. Each week we do part of a quilt and a couple of single projects. I haven't done the quilt centre yet but I have finished the other projects. ﻿﻿﻿ My needle book is actually an inch smaller than it should be because I wasn't paying enough attention when I was cutting the felt whoops! It is still big enough to hold my little scissors, a few needles and a bit of thread so I'm not worried. ﻿﻿ I love my top!!! I only bought a cheap top to practise on. It was on sale for $6 and when I went to pay it was only $2. Bargain! I really enjoyed the whole process. I put it on as soon as I finished the last stitch and I wore it out only to spill 'italian hot chocolate' down the front. I want to try a pair of pants next. I think it would look really good around the bottom of each leg. I will have to think about that more though. Looks great, I love the pink! You got an awesome deal on the shirt! I had to laugh at the spill part, my clothes are like a magnet for hot beverages! Thanks. I'm hoping I will be able to fix most of my stained clothing this way.